LIVE is the first level of the 3-part workshop series LIVE LOVE LAUGH. Tapping onto the surface level of the self, this workshop raises your awareness of your daily persona. What are you like at home, with your family? What are you like at work, with your colleagues? What are you like in society, with your friends? Aiming to get you out of your comfort zone, the GVOM team has prepared fun and insightful activities, and will facilitate individual/group sharing that will guarantee to push you to be [more] adventurous and crave for new experiences that cleanses your emotional palate. Presented by The Hong Kong and Shanghai Hotels, Ltd and Good Vibes Only Movement, we have invited Anya Lim, the co-founder and "Princess Ant" of the ANTHILL Fabric Gallery, to showcase their latest creations around zero waste and what she calls "long lasting wearability - creating timeless pieces that go beyond seasonal trends". 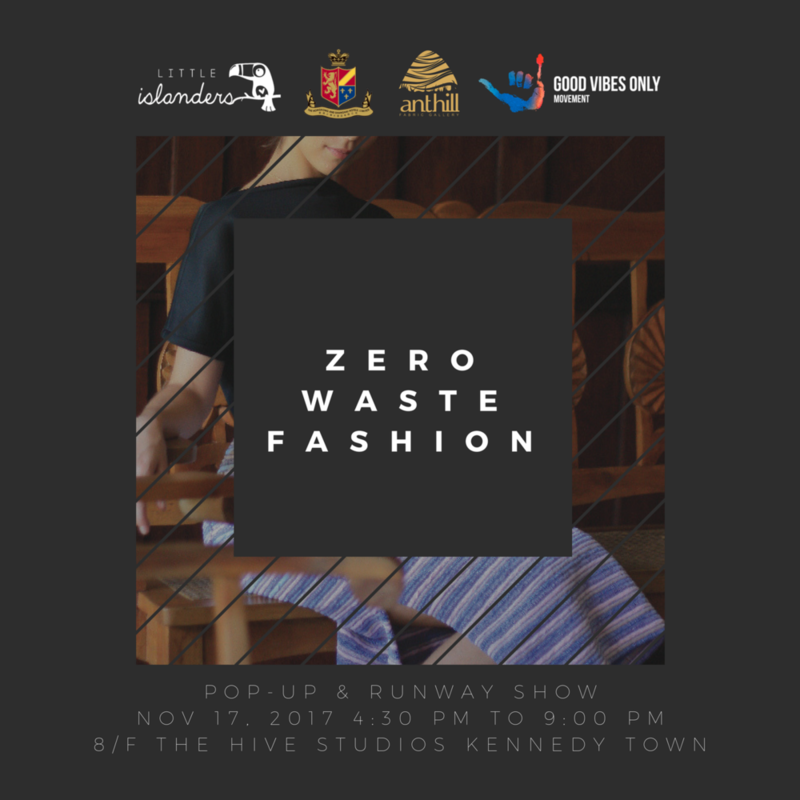 The event will run from 4:30 PM to 9:00 PM on Friday, November 17 at The Hive Studios in Kennedy Town. Pieces from ANTHILL's latest collection will be available for purchase on location. ANTHILL Fabric Gallery will also be joined by their design collaborator, Little Islanders. We have prepared a short programme where you will get a chance to learn more about ANTHILL Fabric Gallery and the treasure trove of empowering stories that comes with it through a small presentation by Anya Lim herself, followed by a mini runway show to highlight the brand's best pieces. Come join us for an afternoon of learning about sustainable fashion and an evening of elegant surprises, networking and great company! Entry is complimentary. On the One is an upcoming street dance event that celebrates the old school style of lockin', looking to bring both dancers and non-dancers alike to one stadium and enjoy the funk and culture that Hong Kong's hip hop community has to provide. Participants will face each other 1 on 1 to compete for the top locker in Hong Kong. They will be judged by world famous South Korean dancers, Luna Yuna and Mr Split. An extra challenge is brought on by an upcoming rising star in the South Korean dance scene, Lock Tan. Aside from the locking category, dancers of other styles will be able to participate in a special all style battle, where selected candidates are randomly paired into teams and battling it out, 2-on-2 style. They will be judged by Mr Split and Hong Kong's very own legends Popping Lok and Man of God. Come to MOM Livehouse on October 15th to get down with Hong Kong's street dancers and learn the real meaning of On the One! Drink for Good is an annual fundraising initiative from HandsOn Hong Kong that provides a platform for people to create positive social impact and give back to the local community, while drinking and eating at Hong Kong's hottest spots! Funds raised are used to support children with special needs. Kicking off on the 4th of October, and running across every Wednesday of the month, you can drop by any participating Drink for Good venue to support the initiative and do your bit for people in need. These venues include Commissary, Foxglove, Lily & Bloom, Potato Head, RED Bar & Restaurant, Runway and Tivo. Drink for Good makes casual drinks with friends or colleagues special; knowing that for every glass you raise, 5% of proceeds will be donated to the charity HandsOn Hong Kong. 10 years of awareness ushering in a new generation of yoga and consciousness in Manila, Philippines. This is the goal of Global Mala Manila, a one-day yoga event with the aim of uniting the global yoga community together with service and collective action. Happening on October 1, 2017, the event will be held from 8:00 am to 7:00 pm at Blue Leaf Events Pavilion in McKinley Hill. The Manila chapter of this international event is spearheaded by host, art consultant, and yogi Teresa Herrera. Women Empowerment platform She Talks Asia joins forces with Global Mala Manila 2017 in a pioneering collaboration. Talks at the event are specially curated to match the themes of wellness. Open to both male and female audiences, it targets the new generation in its call for members to join the steadily increasing yoga and consciousness movements.